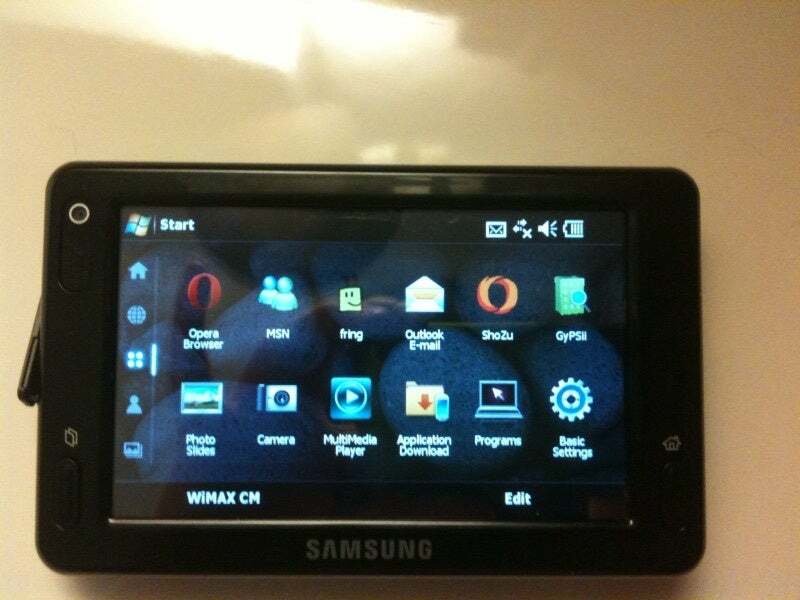 When I first got my hands on the WiMax-enabled Samsung Mondi back in April at CTIA, I was impressed by its slick design, polished TouchWiz 2 interface and multitude of applications. 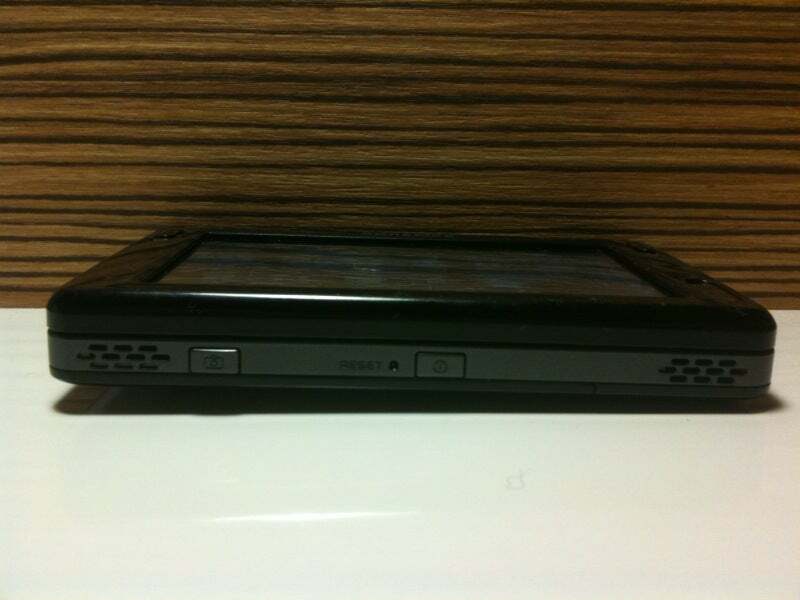 It’s a phone, personal multimedia player, GPS device, and Internet tablet, all packed into one svelte unit. At long last, I had the opportunity to not only to test out its features and usability on a shipping unit, but try out WiMax (in Portland, Ore.), as well. On the whole, the Mondi doesn’t disappoint, but I do have a few design and performance gripes. WiMax, the IEEE standard for fast Internet, 802.16bps connectivity that’s comparable to Wi-Fi, is one of the major appeals of the Mondi. WiMax has further reach, higher data rate, robust QoS, and flexible channel bandwidth than 3G networks. There’s also the cost benefit: Network build-out costs of WiMAX are lower than 3G-based networks. Carriers can offer more cost-competitive voice and data service their WiMax customers. Besides WiMax support, this MID (mobile Internet device) boasts some a gorgeous 4.3-inch LCD touch screen, extensive video (including DivX and audio format support, preloaded GPS software and location-based services apps. It comes packaged with a car kit, car charger and a 3.5 mm 4P headset. A few of the MIDs I’ve played with in the past have been a bit of a burden to tote around like the Archos 5, for example. The Mondi is relatively compact; it measures 4.9 by 3 by 0.6 inches and weighs a manageable 5.4 ounces—3.4 ounces less than the Archos 5 Internet media tablet. The Mondi has a slim profile—notable considering it also packs in a slide-out full QWERTY keyboard. A first glance, the keyboard looks like a messaging addict’s dream: It is spacious, with large keys, a four-way directional pad and a variety of shortcut keys. But as soon as I started tapping away an e-mail, I was immediately disappointed; the keys are too flushed into the phone’s hardware, making them difficult to press. Additionally, the top row of keys is too close to the display’s bezel, so your fingers jam up against it. Samsung’s refresh of its TouchWiz overlay is clean, easy-to-use and intuitive. The Home screen has five “live” widgets that update in real time: Instant Messenger, E-mail, Weather/Time/Date, Internet/Phone and Appointments. When someone IMs you, or you have an upcoming appointment, the widget updates to reflect this. This is a very useful feature, but I wish there were more of these live feed widgets to add on your screen, like a Facebook or news widget, as seen on the Nokia N97. 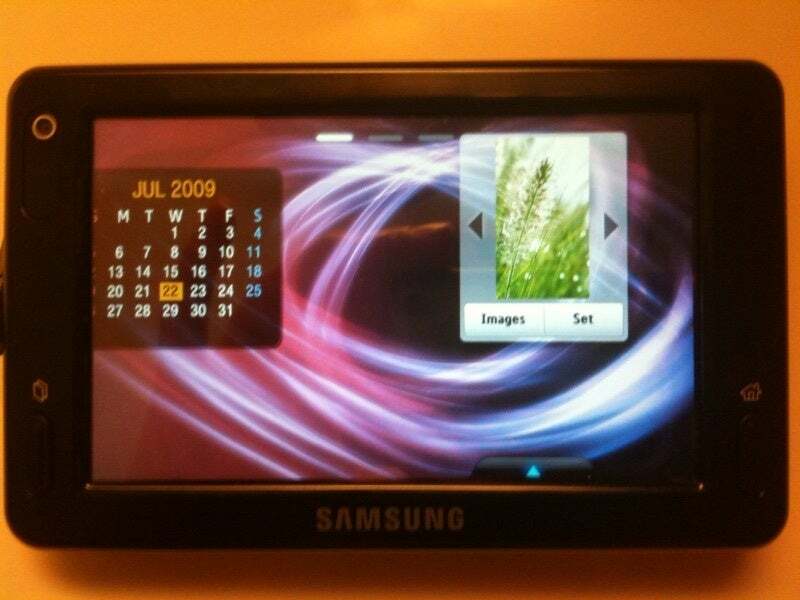 I asked Samsung whether the Mondi will support the Windows 6.5 upgrade. The answer? Probably not. This is unfortunate since Windows 6.5 may address some of these issues with unresponsiveness. The WiMax connectivity made browsing the Web, fortunately, a zippy experience. CNN, ESPN and PCWorld.com all loaded faster over WiMax. Currently, WiMax in Portland is pretty spotty so it seems like deployment has been inconsistent. When I could get a signal, I was impressed by how quickly pages on Opera Mobile loaded. And because the browser supports Flash Lite, Flash-heavy pages like ESPN.com or CNN.com load correctly—a pleasure compared with other popular phones, including Apple’s iPhone 3GS. I also liked the ability to view my browsing history visually: When you go to the Internet screen (one of the options on the side navigation bar), you can see all of the recent pages you viewed in thumbnail view. Some other highlights of the Mondi include its excellent audio and video playback, 3-megapixel camera with various shooting modes and it’s slew of apps (Route 66 GPS software, Fring, ShoZu, GypSii are just a few). I’ll test and discuss these features further in our upcoming full rated review. Overall, in my first impressions, the good outweigh the bad: I can live with the keyboard and the UI is only sluggish occasionally. The future of WiMax is unclear right now, but if you live in an area where the technology has been deployed, the Mondi might let you take advantage of WiMax’s promised, potentially appreciable performance boost over 3G. I relished The ability to have faster-than-3G Internet speed on-the-go is incredibly useful. But be sure you know what coverage is like in your area. In my experience in Portland, I had a lot of difficulty using WiMax in various parts of the city. Often, I had to switch to Wi-Fi, which was problematic when I encountered secure or unreliable networks. While Samsung hasn’t officially announced price, we’ve been told the device will cost over $300 subsidized and over $400 unsubsidized.